Wedding Catering Adelaide specialists Stir It Up Catering appreciate the time and effort that goes into the planning your wedding day. We believe it should be perfect and unique, and in particular the wedding catering. At Stir It Up Catering we use only the best quality locally sourced ingredients to prepare delicious, fresh, wholesome food for weddings, corporate events, private functions & parties. Stir It Up Catering can provide options ranging from casual finger food, platters, grazing stations & buffets to formal three course sit down meals. We provide flexible and professional service and we are committed to using environmentally friendly products. If it’s formal or relaxed sit down to delicious and stylish cocktail canapés, Stir It Up Catering offers a large range of menus to suit any occasion. Our team is able to create a unique menu to suit all your functions from an private parties to large scale corporate and weddings. With have a wide range of wedding catering options available, this way we ensure your day is flawless and unforgettable. Whether we’re providing breakfast, dinner or finger food catering, we supply everything you need, from wait staff to table settings. Striving for perfection in every aspect of our service is what we aim to achieve. Stir It Up Catering brings a professional approach to your event, private function, or wedding celebration in Adelaide and its surrounding suburbs, ensuring your special day will be remembered for years to come. Bring your ideas to our wedding catering team to collaborate on the best menu for your special day. Specialising in one-of-a-kind plated dinners, themed buffets and hors d’oeuvres is sure to please all your guests. Kick off your wedding by partnering with Stir It Up Catering for your rehearsal dinner. We can make it casual with pizzas or we can set the tone for with a traditional delicious menu items like beef ribs or customised pasta dishes. Keep the party going with a opening brunch or the couple send-off breakfast for your party, family, or guests. Stir It Up Catering offers the perfect ratio of sweet and savoury brunch items. Ladies who lunch deserve to have the delightful array of party foods the bridal shower theme calls for. We’ll help feed your guests a light selection of finger foods and appetisers or a build-your-own sandwich bar to complement the mood. What is the role of a wedding caterer? 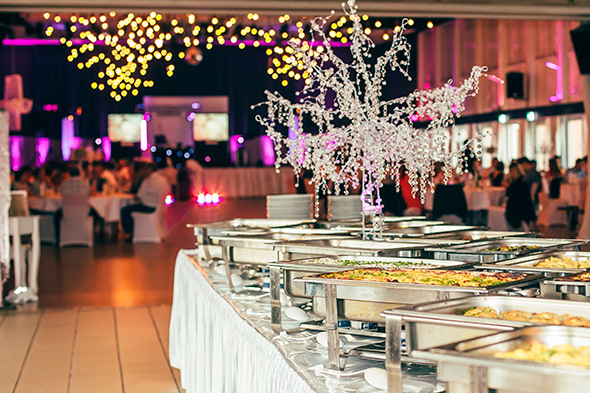 A wedding caterer provides food to the wedding party. The wedding caterer can be hired independently or can be part of a package designed by the venue.